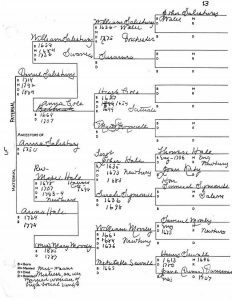 Following up on correcting the charts in my Seeing double blog post, the chart showing my ancestor Anna (Salisbury) Slade was a recent disappointment and involved removing some ancestors from my charts. The chart identified Anna’s parents as Daniel Salisbury and Anna Hale, and had Anna as the child of Rev. Moses Hale (Harvard 1699) and Mary Moody of Newbury, with several early Newbury ancestors including Henry and Jane (Dummer) Sewall, who were the parents of Judge Samuel Sewall (1652–1730), known for his involvement in the Salem witch trials. 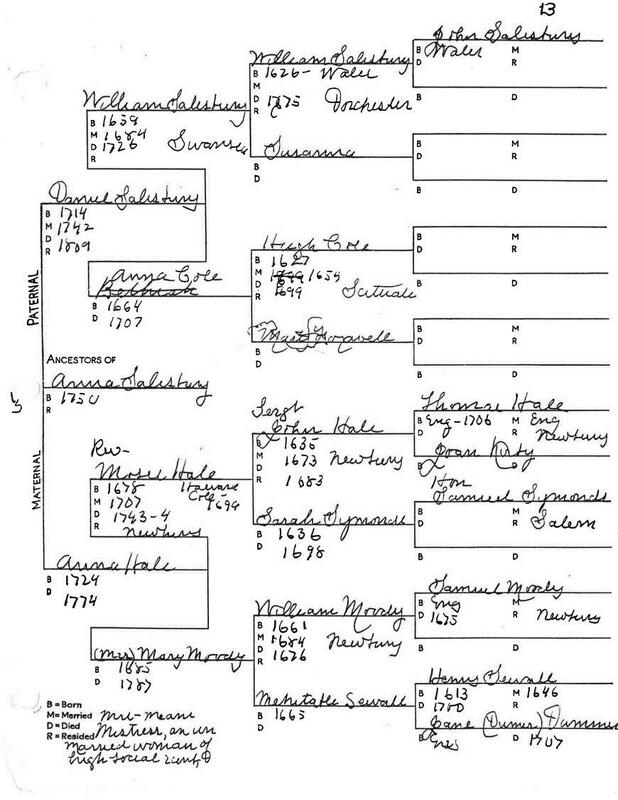 While there are several items wrong on the above chart (the name of Daniel Salisbury’s mother for one), I had not researched everything, and I had not come across anything to make me question Anne Hale’s parents and thus my Sewall descent. In 2007, when we published Eben Graves’s The Descendants of Henry Sewall, I happily looked at the book for my line of descent, which went down to the above Moses Hale and his wife Mary Moody but did not include their children. I had also done various research over the years on some of the Sewall and Dummer ancestors in England. Clearly I had the wrong parents! I could definitely have found this years earlier had I looked. The sketch of Moses Hale in Sibley’s Harvard Graduates says he had three sons and seven daughters, citing the 1889 Genealogy of Descendants of Thomas Hale [of Newbury]; had I consulted that work, I would have seen that Moses did not have a daughter named Anne (from his will, which listed all of his surviving daughters). So in one swoop, I lost nearly all of my Newbury ancestors and gained several new Swansea ancestors. I told the Newbury group I now only had one single early Newbury ancestor – Anthony Morse, through a different (and researched) side of my family. While I still am a several greats nephew of the accused witches, I can say bye-bye as a several greats nephew to one of the judges. Their sister Sarah Cloyce was also accused of witchcraft but was released from jail in 1693. My Town ancestors are included in Lois Payne Hoover, Towne Family – William Towne and Joanna Blessing Salem, Massachusetts 1635 (Baltimore: Otter Bay Books, 2010), and is well documented going down to my ancestor Elizabeth Davis (daughter of Tamar Town) and her husband John Eliot Eaton. I documented the generations from John and Elizabeth down to myself as part of an application to the Jamestowne Society through John Eliot Eaton’s descent from Major-General Daniel Gookin (ca. 1612–1687), briefly of Virginia and later of Cambridge, Massachusetts. Even the Pros get it wrong sometimes, but you made a point to correct it, in this case via this blog. Hopefully you also contacted the findagrave volunteer and thanked them for the gravestone photo and information they provided. This is a good reminder to go back and look at the work we have done, and check it again, and again. I have been going back thru some family history I started 50 years ago adding siblings, their spouses and in-laws as well as dates and places. Thus finding many errors and inventive spellings. ” go back and look at the work we have done, and check it again, and again.” is so true”! Love to hear that I’m not the only genealogist who has seen the need to do some serious pruning on the grafts and suckers that we sometimes find sprouting out of our early research. Sandy Johansen, I loved your sense of humor and metaphors in your post! Chris, this post today was perfect for me to read, as just last night I stayed up to also review, and then reluctantly delete, a host of my Francis Peabody ancestors. I now have no Peabody line…and to make matters worse, years ago a dear friend and I shared the happy news we were Peabody “cousins” from that same line…well, I don’t have the heart to tell her, and of course, nowadays we all realize we really are “cousins” in the larger sense. I had confused two women ancestors with identical names (Rebecca Curtis) the same age, who lived just a few miles apart, with very different sets of parents. Thank you for reassuring us amateurs that this is tricky stuff sometimes, even for the pros! I would love to see your corrected chart. Anne Hale, is the daughter John Haile & Elizabeth Mason; granddaughter of John Haile & Hannah Tillinghast, Pelatiah Mason; and great-granddaughter of Richard Haile & Mary Bullock, Pardon Tillinghast & Lydia Tabor, Sampson Mason & Mary Butterworth, and Timothy Brooks & Mary Russell. Only half of this was “new” ancestry, as I already descended from Pelatiah and Hepsibeth (Brooks) Mason through a different child. You have some of my family names. Not to say they are the same people in my family. But now I need to look at my tree and see if there are additions or corrections there. Just remember findagrave is only as accurate as the person who gave the information. I’ve found it very accurate but I’ve also found errors. When you have a long line of Robert or William who all married Elizabeth there are going to be errors. Excellent reminder to revisit lines we thought were correct, thank you!! I had developed an entire Bisbee family line based on the incorrect information that Thomas Standish, Jr. and Martha Bisbee were the parents of my ancestor, Hadley Standish. Eventually I found out that Martha Bisbee died before Hadley’s birth. His actual mother is Thomas’ second wife, Alice (surname unknown). So good-bye Bisbees. Then, several years ago, I found a listing on findagrave.com showing that another descendant of Hadley had erected a new large memorial marker at Hadley’s grave in Ontario County, New York. The reverse side of the marker traces the lineage of this very well intentioned lady from Miles Standish to her parents. There, carved in stone for all time, is Martha Bisbee as Hadley’s mother. So, Christopher, we must be eighth cousins or thereabouts, as your Jacob Towne is one of my seventh great grandfathers, and we share Rebecca and Mary as great great something aunts. Small world/New England. You have no idea how encouraging it is to find that others, with far superior genealogical creds than me, have assumed ancestries come crashing down around their ears, too (or their trees, as the case may be). My husband, Richard Mason Burnside comes from a whole composite of folks from Swansea. He is descended from Sampson Mason and Mary Butterworth on his mother’s side. When I asked if he recognized the names, he was full of stories (as he always is) about the Hales, where they lived, and who would have been in our generation (we are in our 80s) had they lived. I have done some of the research regarding the Burnsides, and my Dad did quite a bit on the Mason side. There is a Mason Family Cemetery listed under Historical Cemeteries in Rhode Island as WR006. Many of our folks are there. Swansea history is fascinating, as is every other aspect of any family, but having a real live descendant in the family is especially nice. I love being from New England! 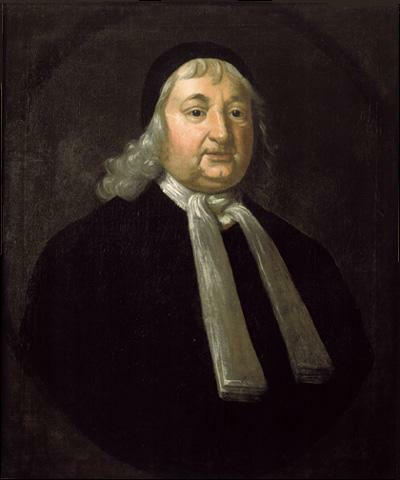 A word of caution on the Descendants of Richard Haile of Swansea (1640–1729) genealogy. Although I have found it to be mostly accurate, I have come across errors in the book. A date typo error (1825 should be 1855), probate record attributed to the wrong Richard Hale, Mary Lawton’s father listed as probably Joseph Lawton instead of Oliver Lawton, and a transcription error from RI vital records. The bright spot is that researching these items that didn’t quite add up right, led to new discoveries and information to fill in my tree. I don’t have Sergt John Hale of Newbury marrying Sarah Symonds. Is your chart on the Hales verified? the chart above (a family chart written by friends of my great-grandparents 80 years ago), as I mention, has several things wrong with it. I have not found the maiden names of John Hale’s wife Sarah, and when I thought this was my ancestor, had her corrected to Sarah _____. I find it more likely that Ser’g John Hale was the son of Thomas Hale Sr. and Tamosine Dowett. His three marriages were to Rebecca Lowell, Sara Somerby, and Sarah (Ring) Cottle.